Wagner is serving a six-week residency at Frost, she will not only have her works performed, but she will also conduct rehearsals and give private lessons to all students in the Frost Composition Program. 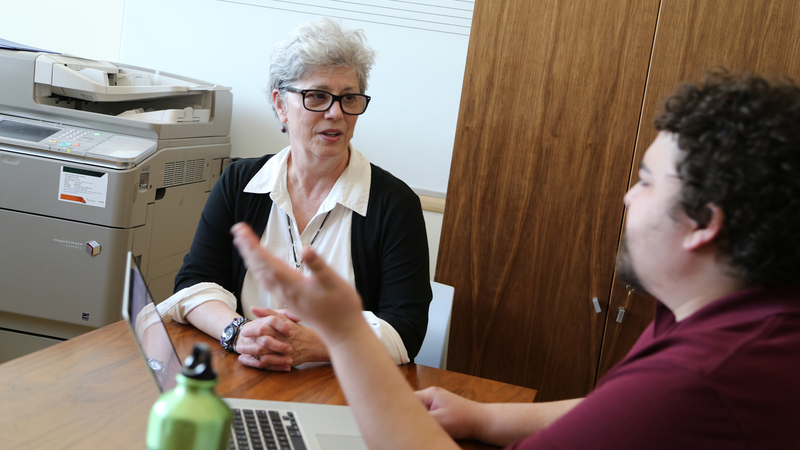 Frost 2019 Distinguished Composer in Residence, Melinda Wagner, speaks in poetic musings when describing her contemporary classical music. Wagner gave a special presentation in the Marta and Austin Weeks Music Library for the Frost Composition forum on February 22, 2019. Wagner’s works have been commissioned and performed by many of the great orchestras and soloists around the world. Championed early on by conductor Daniel Barenboim, her colorful Concerto for Flute, Strings and Percussion for the Chicago Symphony Orchestra earned Wagner the Pulitzer Prize in 1999. It is one of three commissions for the CSO, the most recent being Proceed, Moon performed under the baton of Susanna Mälkki in 2017. Wagner’s three-movement Trombone Concerto, for New York Philharmonic principal trombonist Joseph Alessi, juxtaposes the unique personality of the brass section of an orchestra with the urban pulse of New York City, where Wagner makes her home and serves as faculty of the Composition Department at The Juilliard School of Music. “Experiencing first hand her devotion to musical craft, and her dedication to helping younger composers develop a more rarified compositional technique, is a great opportunity for me as an artist,” added Karcher. Wagner is serving a six-week residency at FROST, divided equally between the spring and fall semesters. During that time, she will not only have her works performed, but she will conduct rehearsals and give private lessons to all students in the Frost Composition Program. The Frost 2020 Distinguished Composer in Residence will be George Lewis. The Frost Department of Theory and Composition is chaired by esteemed professor and composer Charles Norman Mason (BM ’77). On April 16, 2019, The Frost School of Music will present a selection of Wagner’s innovative works at UM’s Maurice Gusman Concert Hall, performed by Ensemble Ibis, under the direction of professor Shawn Crouch. New works by Frost composition faculty will also be performed. The concert begins at 7:30 pm and is free of charge. Learn more about Melinda Wagner at https://www.melindawagnermusic.com. For more on the Composition Program at the highly acclaimed Frost School of Music, visit https://composition.frost.miami.edu.